The city is becoming increasingly unaffordable for anyone except the wealthy. While a growing number of Torontonians may not be able to afford extras like dinners out, theatre, or sporting events, at least the tourists still can. The same tourists who are throwing dollars into the city’s economy are putting a lot of pressure on Toronto’s short-term rental market, thanks to the soaring popularity of home-sharing sites like Airbnb. 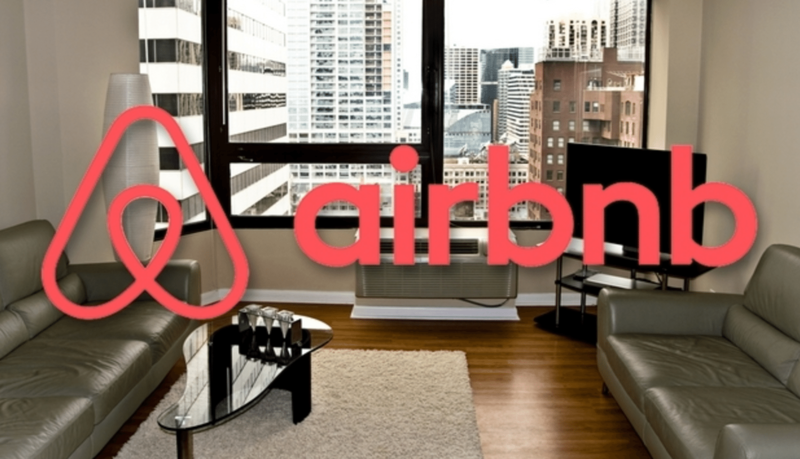 In its disruption of the traditional travel industry, Airbnb has contributed to the dwindling of available rental units in the city core. The extremely limited supply relative to the demand offers undeniable incentive for landlords to jack up rent fees—with some residents reporting a whopping 30 to 50 per cent increase recently. Others face the risk of being kicked out of their homes as their landlords turn their dollar-driven eyes to Airbnb. Toronto resident Ron Campagna recently fought a N12 notice he received in August 2016. The notice involves the ending of a tenancy because a “landlord, purchaser or family member requires the rental unit.” He saw other units in his building being renovated and turned into Airbnb units and feared this was an attempt by his landlord to do the same. While Campagna says that there are other, more serious issues than just Airbnb at play in his situation, taking your landlord to court in any case comes at a cost. Aside from the N12 issues, thanks to the controversial exemption in Ontario’s Residential Tenancies Act, there is no yearly rent cap for properties built after 1991, allowing landlords of the city’s thousands of newer apartments and condo units free reign to increase already high rent prices. As rents continue to climb, Toronto renters are being forced to either give up their places for less desirable spots in other neighbourhoods or move out of the city altogether. Some cough up the additional dollars just to keep a semi-decent roof above their heads. Of course, this is far from ideal for frustrated Toronto renters. The current rental market now makes finding a place within financial reach almost as competitive as the buyers’ market. 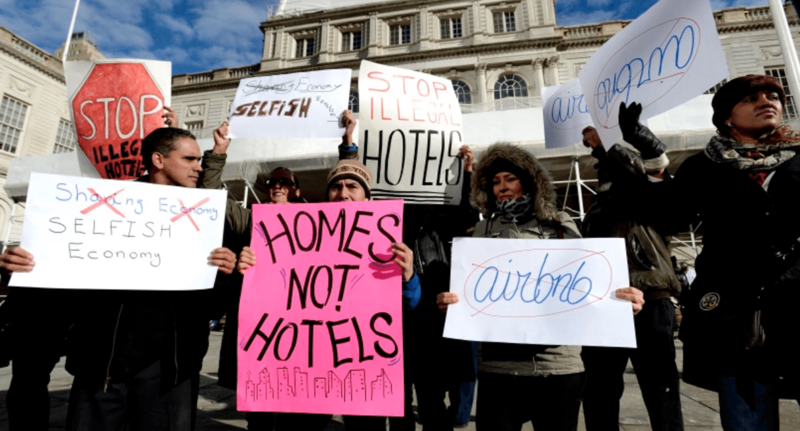 Airbnb is seen as one of the biggest culprits. Last summer, Trip Advisor reported that interest in the short-term Toronto rentals listed on the site had skyrocketed, so much so that it was up 350 per cent compared to 2015. That’s massive, especially when you consider that Toronto’s current rental vacancy rate is 1.3 per cent—a historic low. According to the Fairbnb Coalition—an organization that calls for the city to curb sharing economy apps like Airbnb—in 2010, there were 80 Airbnb units listed in Toronto; by 2016, this figure had risen to over 12,000. 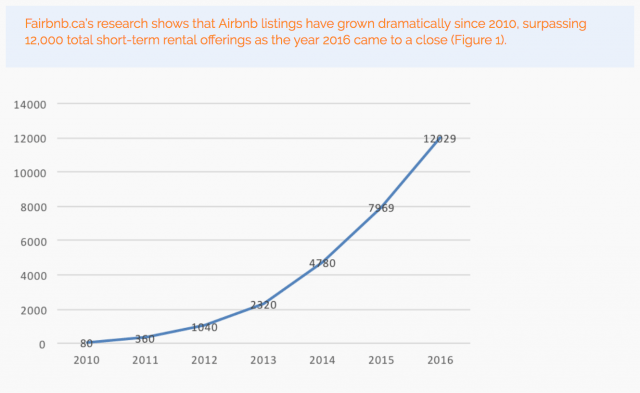 As for homeowners, clearly, they’re taking full advantage of the short-term rental boom. According to Trip Advisor data, the average two-bedroom home in Toronto will typically rent for $1,300 a week. Compared to Toronto’s average monthly rent of $1,800 per month (the average cost of a one-bedroom condo), it’s admittedly way more profitable for mortgage-paying landlords who don’t live in their properties to opt for Airbnb over renting to long-term tenants. From the Canadian Centre for Policy Alternatives 2016 report on Airbnb in Toronto. Meanwhile, as the city’s culinary, arts, and design cultures continue to be put on the map like never before, Toronto has become an attractive vacation destination, resulting in big demand for Airbnb accommodations. Increasingly, tourists would rather spend their vacation money on “living like a local” a la Airbnb as opposed to dropping dollars on pricey hotels. According to Tourism Canada, the city is coming off of its seventh consecutive record-breaking year for tourism. But as the tourists hit the city to take in its tastes, sounds, and sights, the irony is that they make it increasingly difficult for young people who live here to experience Toronto in all of its food, entertainment, and culture-filled glory themselves. Now, they can barely pay their rent, let alone live a little. According to a recent Vice Money story, the base amount you need to bring in annually to survive is $45,000. That figure climbs to $78,000 if you want to be able to actually experience the city (i.e. things like Jays games, concerts, and group restaurant dinners), complete with the odd cab ride. Net worth of owners & renters in Canada. When it comes to Airbnb–the very same platform that allows millennials to travel cheaply—it has some serious consequences on young people that are impossible to ignore. This is especially true in our growing freelance and precarious work economy, where things previous generations took for granted, like benefits and a stable paycheque, are increasingly absent for millennials. Forking out more for rent (sometimes hundreds of dollars more) each time your landlord decides to increase it takes a toll not only on the thickness of your wallet but also on the city. For example, the housing crisis is a blow to Toronto’s grassroots arts community, which is heavily supported by fellow artists. 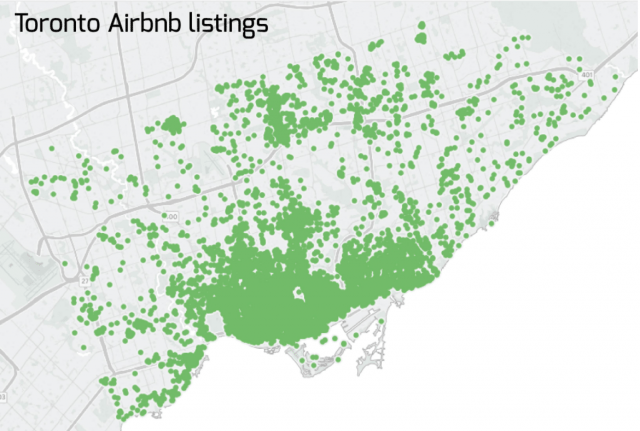 Of course, gentrification has historically done this; Airbnb is simply speeding up the process in Toronto. While culture-craving tourists will continue to check off big musical productions and concerts from their Toronto trip to-do lists, the city’s indie arts scene could suffer as a result of the housing crisis. An increasing number of the city’s indie artists, actors, and musicians—those who support the smaller-scale initiatives—are struggling as rent eats up their sporadic income. When you factor in transportation costs (especially when people are forced to move further away from the city core) and the price of a few drinks, supporting local talent has become more of a “special occasion thing” for many artists I spoke with. Sadly, this is happening at a time when a live music venue seems to close on the regular and when the indie scene needs all the support it can get. For its part, when it comes to the economic impact of Airbnb (that is, aside from that to mortgage-paying homeowners), the company website points to stats claiming that Airbnb guests often stay in a city twice as long as regular visitors, spend 2.1 times as much money, and spend that money in the communities they are staying in. But experts challenge these figures. For example, a study by Morgan Stanley found that only two per cent of travellers would not have taken the trip if Airbnb wasn’t part of the equation. The same figure was found in research by Dr. Daniel Guttentag at Ryerson’s Ted Rogers School. While tourists may put dollars in the pockets of Toronto restaurateurs at a time when fewer locals can afford to eat out, it isn’t shown that they would spend any less if they stayed in a hotel. The lowered rates offered by sites like Airbnb cut into the wages of hotel workers and affect them on two fronts; not only are their jobs at stake, many are forced to pay increasing rent prices. Hotel workers protesting Airbnb. Via cxtmedia.com. The city is now turning to the public for feedback when it comes to the decision to regulate short-term rental services in Toronto and invited the public to attend both its March 28 and April 12 meetings on the issue. Residents can also have their say by filling out an online survey on the City of Toronto website. A staff report that outlines the recommendations will be a topic at an executive committee meeting in June. According to a recent Forum Research Poll in the Sun, Torontonians think that Airbnb should be regulated. Nearly half of respondents (47 per cent) said they believe the city should create rules for the home-sharing company. When it comes down to it, what makes Toronto so amazing is its tourist-attracting vibrancy, but not by allowing corporations to contribute to the affordable housing crisis. While the city needs to attract tourists, we should also learn lessons from cities like Barcelona, which is criticized for catering to tourists at the expense of its citizens. As for Toronto renters, the current debate involves assessing whether it is worth paying these sky-high real estate prices if you can’t even take advantage of what the city has to offer in the first place. Collectively, we need to ask ourselves, who really benefits if Toronto is just a city for tourists and the wealthy—and at what cost?